Sticky Trap Horsefly Trap Glue is the world's leading flytrap glue and it is what makes the traps sticky! The Sticky Trap Glue has been specially developed for catching horseflies, hornets, stable flies, and other biting insects around people and livestock. It is also eco-friendly, water resistant, pesticide-free and completely safe to use! The basic recipe originated in the US and is used around the world to catch aggressive biting insects. 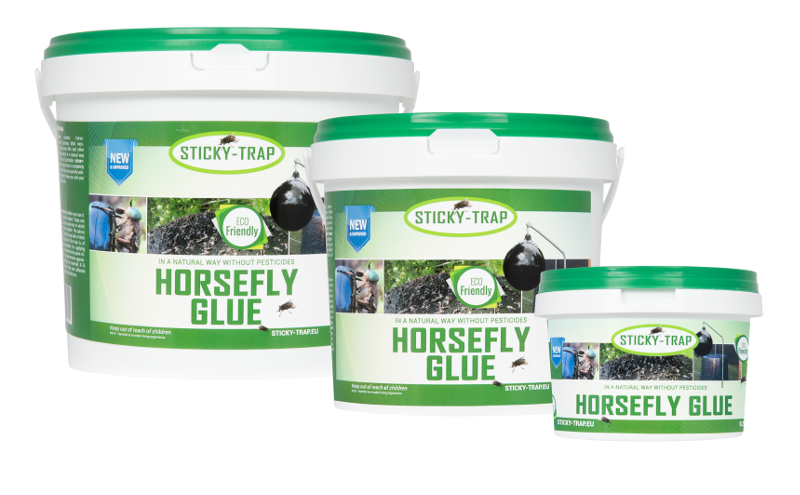 Sticky Trap Horsefly Trap Glue is made from natural minerals, light brown in colour, sticks for a long period (up to 20 weeks! ), and will not attract pollinating insects such as bees and butterflies. Sticky Trap Horsefly Trap Glue’s unique recipe makes it heat resistant up to 70 degrees Celsius. Up to 30 horsefly traps can be made with a 1,5L bucket of Sticky Trap.